A girl who can talk to animals helps a lonely new arrival at the zoo. Zoe Parker lives at her great-uncle’s Rescue Zoo, where her veterinarian mother doctors the animals that Great-Uncle Horace saves from bad situations the world over. But Zoe has a secret—ever since her sixth birthday, she’s been able to communicate with animals. The zoo’s run by Mr. Pinch (“If you ask me, this zoo needs more rules and less fun”). One third of the way in, the main plot finally starts with a rescued lion cub’s arrival. But the starving lion cub refuses to eat; Rory, as the Kenyan lion calls himself, is too sad and lonely from missing his family. 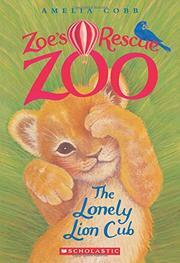 Zoe chats with the zoo’s other lion—grumpy, anti-social Leonard—and learns that he’s pretty lonely too. Guessing that the two of them can solve each other’s loneliness, she persuades her mother to put them in adjacent enclosures. When controlling Mr. Pinch learns of this, he interferes to spite Zoe—an unlikely move. Zoe’s talent is never explained, and Cobb is overreliant on exclamation points to engage her readers. Williams depicts the human characters as white in her grayscale vignettes, often poorly reproduced. Kids wanting more Rescue Zoo stories need not wait: The Puzzled Penguin will be simultaneously released.